Just a few weeks ago, I stumbled upon a product that I thought was so amazing, I have to tell everyone about it! It's called Cold Fire. Let me tell you why I think this is such a great product. 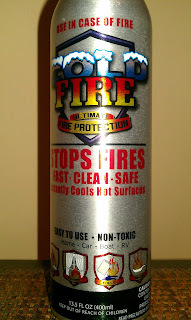 Cold Fire is designed to extinguish small fires and instantly cool hot surfaces. In my personal opinion, I think it is great for homes with kids and seniors. It's just an aerosol spray can. No pins! That's initially what got me excited about it. I know that my kids, ages 9 and 13, as well as my tiny 78-year-old mother, can pop the top off and spray the Cold Fire in case of an emergency. In fact, I actually tested it (rather, my kids tested it) in the fire pit in our backyard. We started a fire and each of my kids took turns spraying it before it was completely out. Immediately after it was out, my older son (21) touched the wood and found it was cold. Not even warm. That impressed me! Knowing that my kids can cook or be at home with their grandmother and have a simple fire extinguisher right there in their reach... one that they can use immediately, gives me a sense of peace when I'm not with them. Not only that... but it can be used in so many other situations. How about 4th of July when you have that bucket of water sitting next to you in case of a fire? And Thanksgiving, when you want to deep fry your turkey? Camping. Boating. Or take it in your car, just in case. It's portable... you can take it anywhere! The other product I bought is Fire Block, a fire retardant. 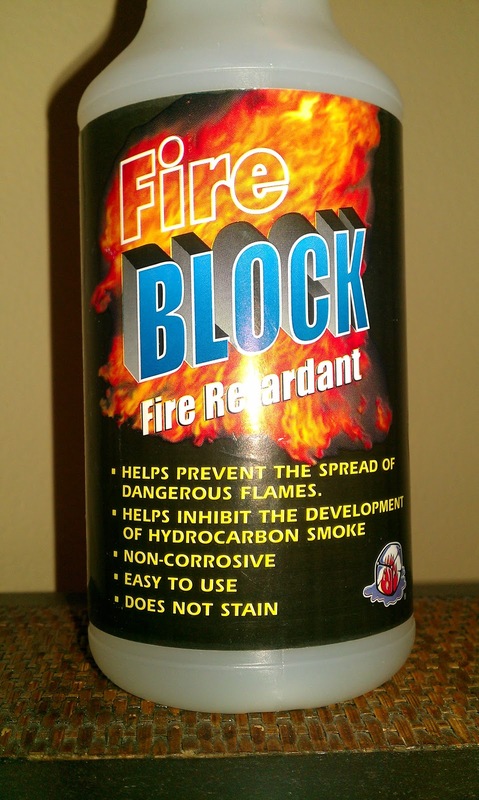 With Fire Block you can actually PREVENT fires. Another amazing product! So many uses, but I really love the idea of using this on live Christmas trees. How wonderful to help prevent the terrible fires that happen because of Christmas trees. What a great way to keep the holidays safe. I have to give credit to my daughter. She was excited about it first when she saw a demo by a friend and then told me how great she thought the product was. So, when this friend came to our house for my daughter's get-together, she asked her if she had brought the Cold Fire with her. Fortunately, she did and she was kind enough to do a demo for us at the end of the evening, which another of her friends so kindly made into the video above. Great job!